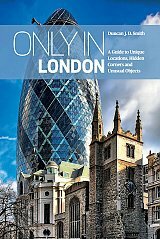 Only in London is a comprehensive illustrated guide to more than 100 fascinating and unusual historical sites in one of Europe's great capital cities, including Roman ruins and sci-fi skyscrapers, little-known museums and novel art spaces, ancient customs and living traditions. From Roman Londinium and Shakespeare's Globe to Winston Churchill's bunker and graffiti artist Banksy. Locations include the Necropolis Railway, Soho's Buddhist temple, ghost stations on the Tube, and the best Eel and Pie shop.